Fresh And Easy, why so coy? 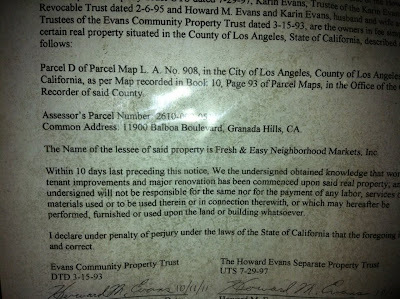 Intrepid reader Chris Furia snapped this photo that confirms what Fresh and Easy Corporate HQ refused to admit: they're opening in Granada Hills, in the former How's location. No es Rancio y Difícil, amigos. Es Fresco y Fácil! It really wasn't much of a secret. Ten weeks ago when I stuck my head in to the contruction trailer that was there at the time to inquire what was going on, there were plans all over that said Fresh & Easy on the top, and the foreman there at the time readily offered that they were prepping it to be a Fresh & East store. He was clearly wrong about the time table though as he indicated they expected to be done by the beginning of November and upon looking in to the store facade yesterday, they still have a long way to go. No, it wasn't a secret, which is why I'm still puzzled as to why the Fresh and Easy media rep refused to confirm over the phone. Although it wasn't a secret, it's weird that they didn't come to the community like every other business does. I believe it must have something to do with their reputation. I had no idea so many people didn't like Fresh & Easy. I've never been to one so I can't say, but I can tell by the way they're starting out that they won't be anything like HOWS. I believe I posted before that I had calls on my caller ID from Fresh & Easy but no message and when I tried to call the number back, it didn't take incoming calls. I think that's weird. 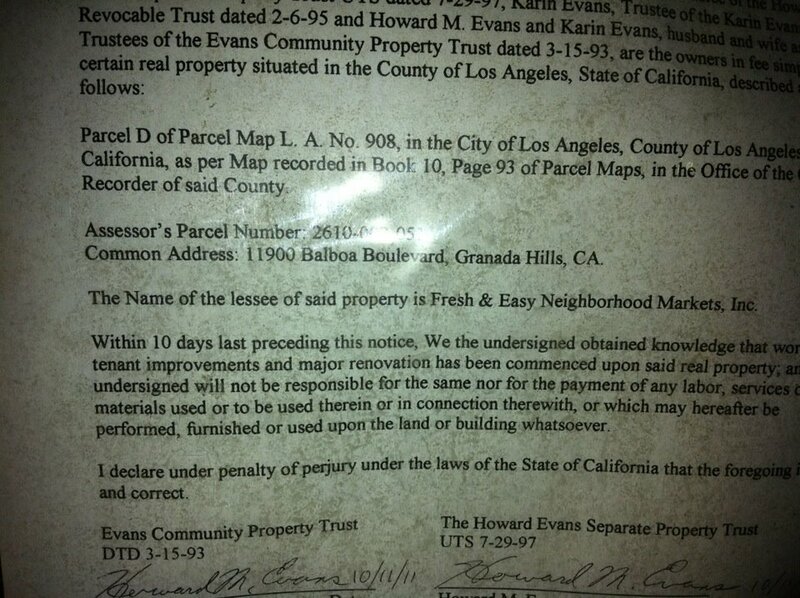 Also, the kids who tried to go on to their website to apply for jobs never found a Granada Hills location there. The traffic light was paid for and voted on in City Council. The Councilman spoke about it at our September NC meeting when he was our guest speaker. >>> "The traffic light was paid for and voted on in City Council. The Councilman spoke about it at our September NC meeting when he was our guest speaker." After passing the Council 11-0 on Feb. 12, 2010, council file # 09-0742-S1 was automatically approved on March 1, 2010 when the Mayor failed to either veto or sign the legislation. earmark requires a 20% local match ($24,000) bringing the project grant total to $120,000. However, based on the preliminary design, the estimated cost of the project increased to $250,000. This cost increase is mainly attributed to the unusually high escalation in construction materials (steel, concrete, asphalt, etc.) over the recent years. The City sought to make up the known project deficit of $130,000 with funding through the American Recovery and Reinvestment Act (ARRA) of 2009 as part of the City's Tier C economic stimulus package list submitted to the Los Angeles County Metropolitan Transportation Authority. However, the City has not been able to secure this funding. In addition, the actual federal appropriation received was $86,391 instead of $96,000. With a 20% local match of $17,278.20, the actual grant total is $103,669 instead of $120,000. This brings the total amount of the shortfall to $146,331. To ensure completion of this project, it is necessary to receive and deposit necessary funds from another source. I THEREFORE MOVE that the City Council AUTHORIZE DOT to receive funds from the CD 12 Sunshine Canyon Amenities Trust Fund No. 699, Account 1000 in the amount of $146,331 and deposit them into Proposition C Anti-Gridlock Fnnd No. 540, Balboa Boulevard at Knollwood Shopping Center Project, Account No. E225." Oh, sorry, I was being logical for an instant - I totally forgot this is L.A.! Mitch can cover it from his salary of $180,000 a year - he owns a house in Knollwood, after all. A quarter of a million dollars for a simple traffic light. No wonder governments go broke, and why our taxes are so high.